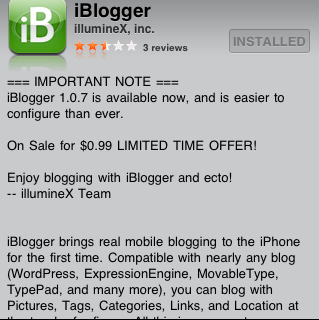 Are you looking for an excellent iPhone app to blog with on your iPhone? Look no further than iBlogger! It regularly sells for $9.99 in the App Store but right now it’s on sale for 90% off! That’s a steal and it just so happens that this post was written with iBlogger! A big thanks to Just Another iPhone Blog for the heads up on this sale! Happy blogging!